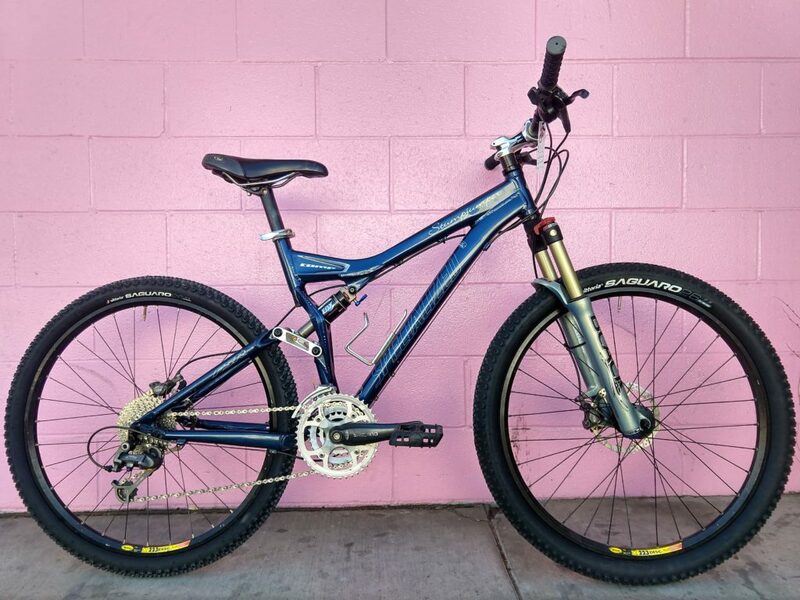 The April bike of the month is this bouncy 2005 Specialized Stumpjumber FSR Comp Disc. It took some digging to figure it out, but this is that year’s women’s-specific model! You don’t have to be a woman to ride it, and you might be interested to know a bit about the history as well as controversy over the applicability and relevance of “women’s-specific design” (WSD) over the past decade. The truly burning question, on which the cycling industry does not agree, is whether “good bike design for women” is the area which has the most potential for market growth, or if it’s actually design for people of all genders with small bodies. When WSD was first introduced, the “shrink it and pink it” mentality reigned supreme, where “women’s bikes” often simply meant smaller frames with stereotypical paint jobs and a lower level of components than their unisex counterparts. This is still problematic in 2019, but some brands have come quite a way, and use a few philosophical approaches to the challenge of designing for women. Some companies favor geometry designed for “average” women’s body dimensions, usually favoring riders with shorter torsos and longer legs. Others start with identical men’s and women’s frames, but adjust components—primarily touch points: this means narrower bars, less bulky grips, shorter cranks and stems, and women’s saddles. As builders shrink frame sizes, they’ll sometimes switch to smaller wheels (e.g. swapping 650b for 700c) to maintain handling characteristics—as opposed to slackening the head angle, increasing the fork rake to make larger wheels fit. Most women’s mountain bikes also come with forks and shocks that are tuned for lighter riders. The troubling thing about “women’s specific” designs and modifications is that they both exclude some women (women’s bodies differ from other women’s bodies as much as they do from men’s bodies) and alienate some men who could benefit from embracing them. And our poor nonbinary friends—where are they supposed to fall? Maybe we should just get to it, and tell you about this particular bike’s specs so you’ll know if it might work for you! The frame is TIG-welded aluminum; it is equipped with a Manitou Black Elite 100mm travel fork and Fox Float Triad 3-position, 100mm travel rear shock. On first look I assumed it had a mish-mash of replacement components, but nope, it came stock with a “Mountain Mix” that includes Avid Juicy 5 brakes & levers, and both Shimano Deore LX and XTR shift parts. I think the original (26″) wheels may have been rebuilt, but the Mavic X233 disc rims on this model don’t have any noticeable differences from the stock X317 disc rim. On the other hand, it still has its original Specialized Women’s BG saddle. We’ve overhauled the whole thing and popped some beautifully-knobbed Vittoria Saguaro tires on (2.2″ on front, 2.0″ on back. Sweet). Finally, the seat tube is (C-T) 18″, standover is 27.5″, and the effective top tube length is 22″, actual length is 21″; the stem measures 80mm. It’s great for a medium-size rider, 5’8″-6′ who’s ready to shred some bumpy trail and has $450 to shell out!